Finally, caught up and on track. Although I spent two hours on this, it didn’t all go well. However I was able to pull some of it back. Still always more to work on, faces at funny angles/foreshortening. I have managed to embrace what a splotchy wash the ink I’m using makes. Now I except it, I can sort of plan for it to be part of the piece, instead of something I am fighting against. 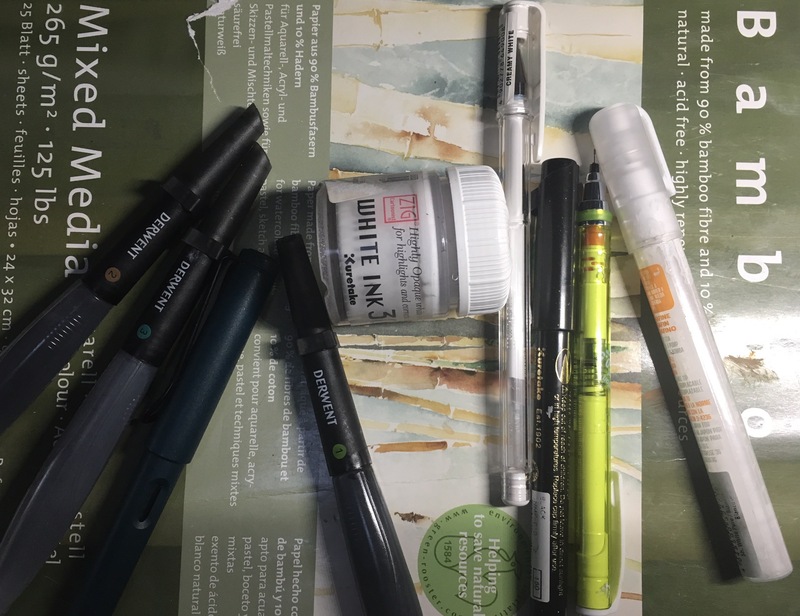 I used my derwent ink brushes, kuratake white ink 30, white gel pen, white acrylic marker, kuretake zig manga flexible fine brush pen, kuru toga pencil and my fountain pen. Stock was from Here. I had to do a lot of whiting out. The white ink is a point of no return though, the ink won’t lay flat over it. I am going to have to find my gouache!